The Pink Shirts were out in force this weekend. They held rallies at Victory Monument in Bangkok, just a stone’s throw from the Red Shirt rallies in Ratchaprasong and conveniently just a few minutes away on Bangkok’s excellent light rail system. The Pink Shirts claim that they don’t support either the Red Shirts or the Yellow Shirts. 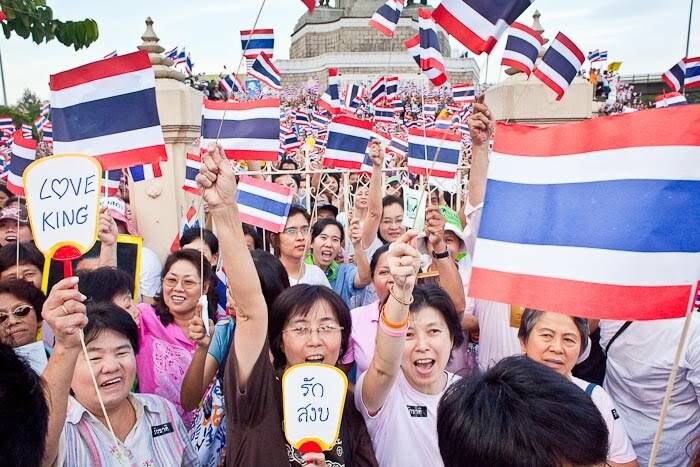 They say they support the King and want peace in Thailand. They tend to represent people in the tourist industry, finance, higher education and business. All economic sectors that have been hard hit during this round of street protests. I’m really bad at counting crowds, but there were a lot of people at Victory Monument last night. Certainly more than there were in Lumpini Park the last time I photographed the Pink Shirts. The area around the monument was packed and the crowd extended into the Skytrain station two blocks away. It was an impressive turnout for the Pink Shirts but just a fraction of the numbers the Red Shirts attract. There are more photos of the Pink Shirts’ rally Sunday in my PhotoShelter archive and available from ZUMA Press.